Rich Parker was inspecting a home in Keller Texas and look what he found. 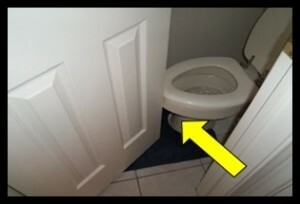 So the guest goes in the right between the wall and the toilet, then closes the door, or do they straddle the toilet then close the door? Professional Home Inspections are so important. This buyer noticed there was a bathroom in the hall yet it did not occur to them that the door would make it almost impossible to enter. Keller Texas Home Buyers we encourage you to have your home inspected!